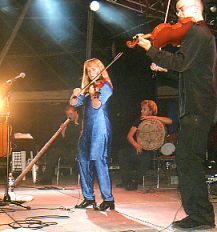 At the end of 2000 Gjallarhorn released their second cd called Sjofn. Their first cd Ranarop had been released a few years before on an international label but owing to the inadequate distribution and bad commercial management of the record company this cd never reached many listeners. How different that is with Sjofn. Not only did it surprise many reviewers of folk magazines; it also found its way into several rock magazines as being original and stunning psycho music. Lead singer Jenny Wilhelmsen is the driving force behind the group and almost addicted to finding new material. New material? No, ... old material. Songs that have a long tradition, tunes that cannot be found in a written form but still exist on old tapes or in people's hearts. Although their music sounds very modern, Jenny denies that they play modern folk music. 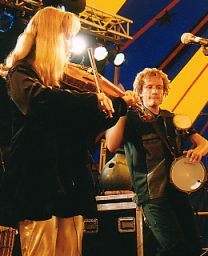 Jenny: "I do not want people to call our music modern folk music. We want to stay as close to tradition as possible. I think that the music has enough to offer and does not need electronic instruments to make it fit in with our modern times." Although they stay close to tradition, the instruments they use are not all traditional Scandinavian ones. The didgeridoo plays an important part in Gjallarhorn's music. Jenny: "To be honest, I was terribly prejudiced against the didgeridoo. I know a few groups who only use this instrument because of its special sound and not because it adds something to their music. But in much of the old material they originally used a drone. Violins played in a special way were largely responsible for this basic, almost hypnotizing tone. One night we were playing old traditional songs on the violin when our didgeridoo player joined in and we discovered that this was a great combination. The didgeridoo had the same hypnotizing drone and sounded great with the violins. Many people have criticized the fact that we make use of percussion instruments. These people forget that percussion was frequently used in traditional music. We do not always use the same percussion instruments but they certainly contribute to our special sound. Instead of violins we use the didgeridoo and instead of the old shaman drum we use percussion instruments from other parts of the world." Most material that can be heard on Sjofn dates back to the Middle Ages, but the Runo tradition is also an important source of inspiration. Jenny: "Runo is a very old vocal tradition that is approximately 2000 years old and was mainly used in Finland and the Baltic states. For many people it was like a second language and they used it until about 100 years ago. Runo was used to "broadcast" certain messages and it has many similarities to Nordic mythology. It has the same structure and there is a lot of symbolism in the texts. For me, the Runo tradition is so fascinating because it is still very close to the original. That is also why I am studying in Norway at the moment; it is a very special country with many old traditions. Some valleys have been cut off from the rest of the world for ages and you still find well-preserved vocal traditions there. Telemarken is one of the most famous examples of such valleys." The process of making a new cd takes a lot of time but Jenny puts her heart and soul into it. Jenny: "We are not the kind of group that want to release a cd each year and I cannot tell you what our next cd will sound like either. As I told you before, I will be studying in Norway for a year and that country is fantastic, so I'm sure we will use some Norwegian music on our next album. It's so fascinating to listen to old recordings and meet people who are still part of that ancient tradition." Please visit www.gjallarhorn.com for more info, music and videoclips.